Thank you for quality assurance! "Sandmarc's commitment for quality assurance is very commendable. Sandmarc sent me an aluminum replacement across the Pacific (I live in the Philippines) for a broken tripod mount sold to me by www.kimstore.com (after just a week or so of active usage and they offered to sell me another brand instead of facilitating replacement!). I thought I wouldn't be able to use my pole with my GoPro Hero4 again but I'm using them again now for pure and extreme fun! Thank you for restoring my faith on product warranties. God bless you!" Best way to carry your gear! "This bag is absolutely awesome. It allows you to carry and keep all your gear safe without being so restricting! A must buy in my eyes! :) Love all my Sandmarc Gear!" "Very satisfied with the product! :)"
"100% Freaking amazing. Hands down,"
SANDMARC METAL ED. IS GREAT!! "I USE IT AS MUCH AS I CAN! THE MOUNT PROCESS IS EASY! USER FRIENDLY! AND I LOVE THAT IT DOESNT TWIST WHILE THE CAMERA IS MOVING DUE TO ITS WEIGHT. TOTALLY RECOMMEND IT!" "works exactly as advertised. Easy to use, durable, and exactly what I was looking for when I ordered it. It even was delivered a day earlier than expected! 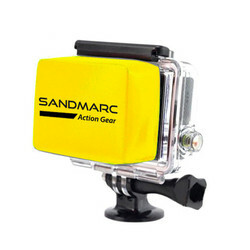 Definitely looking forward to ordering more products in the near future"
"I ordered this item from Sandmarc to vew what was under my boat with a GoPro . The delivery time was quick. The Metal Edition Pole was everything I had hoped for. They are very well manufactured with a high quality finish. I would recomend this product." "Haven't been able to use it yet but it seems very sturdy. The metal doesn't make it too heavy as well"
"I used it for several occassions now.. I'm about to use it for snowboarding this valentine weekend.. very sturdy product.. keep it up!" "So far this stick is wonderful. Haven't had the opportunity to go swimming with it but the construction is solid." "Works great, very unique, looks a lot better then the generic go pole at best buy. Id go for this one over the generic ones!" "Great pole I've been using it everywhere now and haven't encountered a single hitch. Being able to dismantle the pole and dry it thoroughly us a huge bonus"
"works perfect the best !!!!" "Hi sandmarc, my new pole - black edition is ok, it arrived in time, thank a lot, you are so fast"
"It worked great and was very sturdy. It held up even when I took some hard hits." "It's light and easy to adjust, perfect for me." "definitely worth it. I bring my pack with me on my snowboarding trips. Keeps everything organized and in one place!" "Its an awesome pole for the gopro! The grip on the bottom of the pole feels real nice and its easy to extend the pol no problem! Will purchase another one really soon!" "Bought this because I wanted something more compact vs the Sandmarc pole that extends because I was heading down to San Diego and was going to be jumping off cliffs into the ocean. The Carbon Grip is very lightweight and holds up very well. The safety leash diminishes the worry of a sinking GoPro. I still attached a floaty to the back of the camera, just for extra reassurance. Product has a very comfortable grip. If you're on the fence about getting one I say go for it, you won't be disappointed." "Overall, this is a good product that does exactly what it says. Great for swimming in the pool. Wrist strap is of very high quality and comfortable to wear." "works great! Hoping to order more soon." 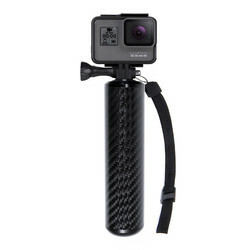 Cleanest, Most Durable GoPro pole on the market! "I have had this pole since it's early launch in 2014 and I have fallen in love. If you are a avid GoPro user, there is no reason you shouldn't have a pole to help improve your shots. 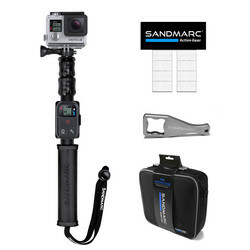 The Sandmarc Pole Black Edition is perfect and affordable for all your needs. Made from strong, durable materials it will last for years and is at a fair price. It is versatile due to the wide variety of length options. You get a solid grip and a good feeling of assurance with the wrist lanyard. Overall, I have had no problems and have the footage to prove it! Check out some of the shots ive gotten with the Sandmarc pole at http://www.youtube.com/brandonbair 5/5!" "I'm an active person and I'm rough in my stuff. This pole has been through a lot-- hiking, water sports, travel, etc, and has managed to stay rust free and has stood up to my abuse. I Paddleboard and love that this pole extends far enough out to capture shots of my entire board. The rubber handle grips well not just in my hand but also in between rocks or other objects when I use it hands free in the place f a tripod. It's compact enough to fit in a standard size backpack but long enough for unlimited wide angle shots." 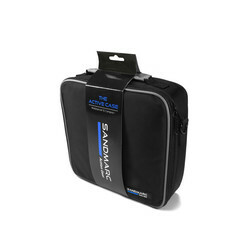 "This bag is great-- I'm able to fit my gopro and all of my accessories in this bag. The padded construction along with the interior dividers and zippered pocket keep things from moving around and banging into eachother. I'm able to take this bag with me to the beach and not worry about my gear getting sandy or wet, and it's small enough that it's not ridiculous to pack it in my back pack while on the go. This bag has also been The perfect place to store and carry portable external hard drive. Durable and high quality, I would recommend this for anyone looking for a way to protect and organize their gopro and accessories." Great alternative to a floaty! "I have the Gopro 4 silver, which has a built in LCD screen. Most of my gopro use is on the water, so it's awesome to have a floating grip so there's no need for the floaty back pack that makes viewing the LCD screen impossible. The super light weight carbon fiber construction also makes this grip durable enough to withstand the constant abuse of my active lifestyle and clumsiness and light enough to toss into my bag as an additional option alongside my Sandmarc Pole." "When they say it is durable, believe it. If your looking for an affordable, while still gives you everything it's got, buy this pole. You wont regret it."